Nearly all solutions are Pareto non-dominated for multi-objective problems with more than three conflicting objectives. Thus, the comparison of solutions is a critical issue in many objective optimization. A simple but effective normalized ranking metric based method is proposed to compare solutions in this paper. All solutions are ranked by the sum of normalized fitness value of each objective. A solution with a small value is considered to be a good solution for minimum optimization problems. To enhance the population diversity of all solutions, the solutions with small values and the solutions with better fitness values on each objective are kept in an archive and updated per iteration. This ranking metric is further utilized in a particle swarm optimization algorithm to solve multiobjective and many objective problems. Four benchmark problems are utilized to test the proposed algorithm. 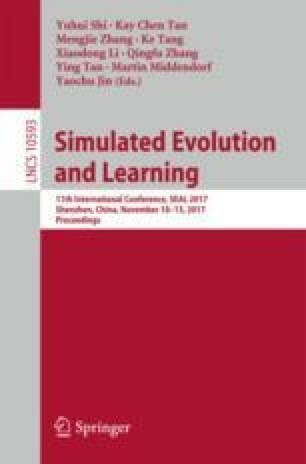 Experimental results demonstrate that the proposed algorithm is a promising approach for solving the multiobjective and many objective optimization problems. This work was supported in part by the National Natural Science Foundation of China under Grant 61672334, 61403121, and 61273367; in part by the Shenzhen Science and Technology Innovation Committee under grant number ZDSYS201703031748284; and in part by the Fundamental Research Funds for the Central Universities under Grant GK201703062.